"There's a grand new organ in town. It is a Casavant of 3.364 pipes and 60 ranks, and it gave its inaugural concert yesterday afternoon at the Foundry United Methodist Church. The expert organist who also supervised the installation and design was Eileen Guenther. who presented a program to demon¬strate the instrument's capabilities to the SRO audience. It was an immediate success; the organ is a knockout." Thus wrote Ed Mattos in his review in The Washington Post on February 24, 1985. It was no accident, no overnight miracle that this instrument found its way to the heart of Washington. D.C. It was the product of more than three years of careful planning and hard work through the leadership not only of Dr. Guenther and the sanctuary renovation committee, but of a broad spectrum of the Foundry Church community. 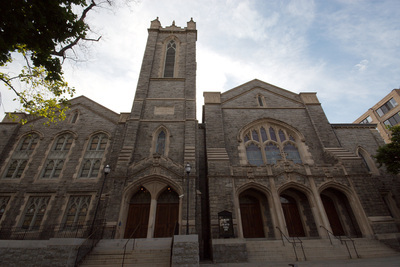 Founded in 1814, Foundry is one of the oldest and most active churches in downtown Washington. Located just eight blocks north of the White House, Foundry has long been known for its outstanding preaching ministry (Senior Minister Dr. Edward Bauman was named by Time magazine one of the seven preeminent preachers in America), its active ministry to people in need, and its strong music program. Foundry's music program includes children's choirs, The Joyful Noise (a group of 20 adults specializing in con¬temporary Christian music) and the 55-voice Foundry Choir. Considered one of the finest church choirs in Washington, the Foundry Choir was honored to be se¬lected to lead the opening communion service of the United Methodist Church's General Conference in Balti¬more in May 1984, held in celebration of the bicentennial of Methodism in America. Foundry is a church that takes its plural roles in the community seriously. 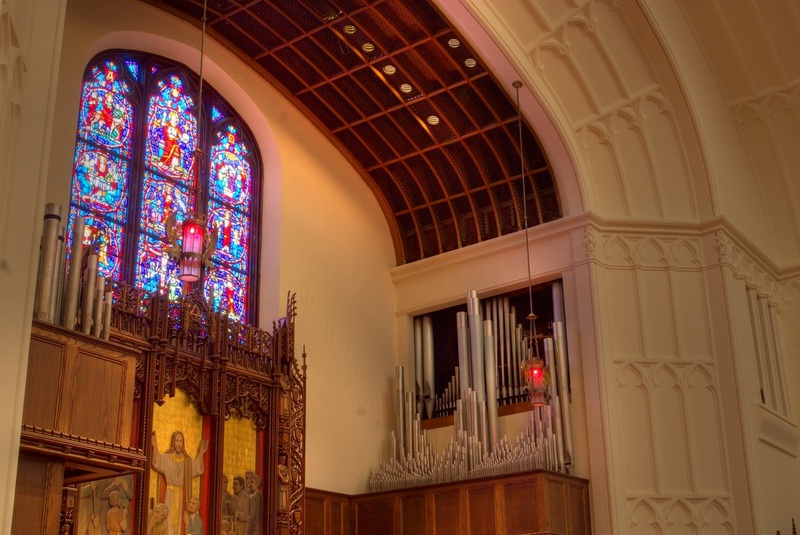 It did not take long for the sanctuary renovation committee—originally called the organ committee—to realize that its purpose was to be greater than just deciding whether to renovate an old organ or to purchase a new one. And it was more than a small group composed of musicians and clergy. The renovation com¬mittee members were representative of the congregation as a whole, and the process of creating an organ and resulting environment was to be unusual and exciting. The committee visited many churches in the Washington area as well as out of state and decided that it wanted the new Foundry organ to be special: to do some things better and more beautifully than other instruments. They determined that the focus was to be French litera¬ture, both Classic and Romantic, and, working with Casavant's Donald Corbett and Jean-Louis Coignet, the choice of stops and voicing reflect this goal. At every stage of the operation the congregation was given opportunity for input. Bulletin inserts explained how the project was developing and what the costs were to be in time, labor and money. Mission groups wanted to be assured that their programs would not be shortchanged by fund-raising efforts. and, as changes in the sanctuary became obvious, contributors to earlier projects and donors of memorials wanted to be assured that these would be protected. But over and over, when the votes were taken in committees, councils and church boards, the support was strong and enthusiastic. It was an exciting time for the congregation as they watched the renovation plan, designed by AIA-award-winning architect Darrell Downing Rippeteau, become reality. The 900-seat sanctuary is acoustically resonant, dominated by the large dome in the ceiling. The renovation, supervised by Rev. 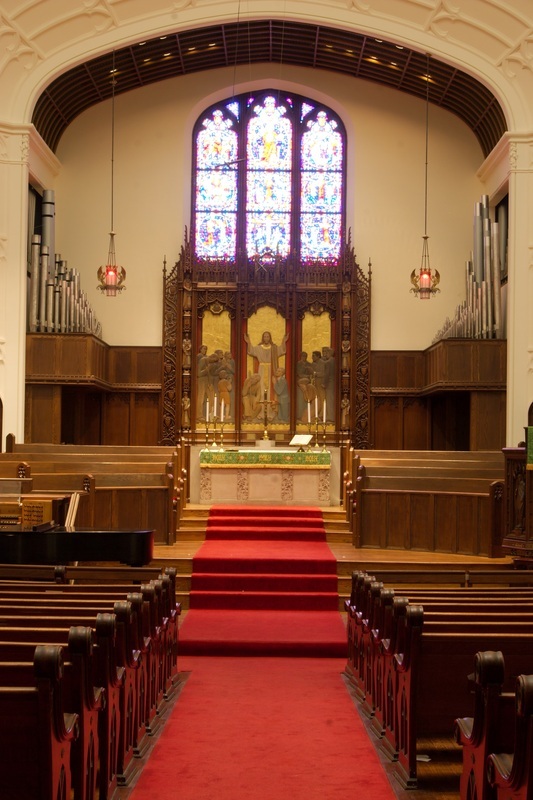 Donald Stewart, returned the sanctuary to its original "Akron plan" by relocating the choir so that it again faces the congregation, its slightly curved seating completing the curve of the existing sanctuary seating. The lectern, altar railing and organ console are all movable, offering needed flexibility in the chancel. The organ chambers were enlarged and insulated, their surfaces treated for maximum projection of the sound into the room. The constituency of Foundry church is diverse, with regular Sunday worshipers ranging from Cabinet members to street people. 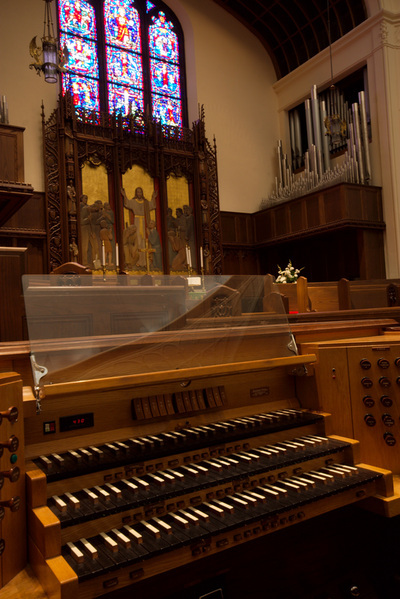 A large percentage of the congregation contributed to the organ project, with gifts ranging from $1 to $5,000. Little wonder that the church was packed on December 18, 1984, when the new organ was heard for the first time. The musical centerpiece of this consecration service was John Rutter's GJoria, performed by the Foundry Choir, brass, percussion and organ. In his Washington Post review, Ed Mattos described the tonal properties of the instrument: "It is an organ that is orchestral in feeling but possessed of great clarity and definition. It is without ques¬tion the right instrument in the right place, fitting its acoustic surroundings and open to the great bulk of organ liter¬ature and choral accompaniment. Com¬bining 18th- and 19th-century organ concepts, it comes out of French tastes. It speaks evenly and robustly. The reeds are nasal and sassy; the mixtures are big and resonant; the flutes and strings are soft but not cloying." However, since the foundation of the organ repertoire definitely resides in the works of Bach, great care was taken to ensure that this instrument would also reproduce faithfully the works of Bach and other Baroque masters. In this instance, too, the artistry of Casavant's voicers is demonstrated. As Paul Hume, WGMS music critic, said, "The organ is French in inspiration, but sounds won¬derful in Bach and contemporary music from England and from this country." Subsequent programs in the inaugural series drew warm praise from critics and audience alike. In May 1985, James Moeser played an all-Bach program at Foundry, and in his review Joseph McLellan, Washington Post music critic, commented: "The climax of [Moeser's] program came after intermission when he played Part III of Bach's Clavierübung the only part of that great series of keyboard works that is devoted to the organ. The set ends with the magnificent 'St Anne' Fugue, an exciting work and one of great power—ideal to end a recital and to demonstrate the power of a great organ, which this Casavant certainly is." In September, eleven Washington organists joined Eileen Guenther in a Franck-a-thon at which all twelve of Franck's major organ works were played in succession. Of this event Joseph McLellan wrote in the Post: "Sharing the spotlight with the composer and performers, the new organ was exactly right for the occasion. Built by a French-Canadian company that began building organs at about the time Franck began playing them, this Casavant is solidly in the French tradition and an ideal instrument for this music. Light and quick in response, rich and brilliant in its tonal palette, it has a beautifully balanced, transparent sound that can impress by its sheer power without losing the essential clarity." In the Grand-Orgue, there is a Grand Plein Jeu which incorporates a mixture in the 16' series. There are also a Grand Cornet and a 16' Bourdon of generous scale. The principals are broad, yet the chorus has clarity and definition. The Recit has harmonic reeds with Cavaille-Coll shallots, harmonic flutes at 4' and 2' pitches, plus mutations. Principals at 8' and 4' are capped by a five-rank Plein Jeu. Two sets of undulating stops, the Hautbois and Voix humaine complete the tonal palette. The Positif principal chorus is complete from 8' to three-rank Cymbale. There are flutes at 8', 4' and 1 1/3 pitch, and also the ubiquitous Cromorne. Additionally, there is a 16' Basson as in Messiaen's instrument at La Trinité in Paris. The principal chorus of the Pédale is based on an open wood Contrebasse of 16' pitch and is complete to a four-rank Mixture. The Bombarde 32'-16'-8' unit provides a strong reed foundation. Judicious borrowings from the manuals add color and accompanimental possibilities. In addition to the manual natural keys constructed in ebony, with manual sharps of rosewood with ivory caps, pedal naturals of maple and pedal sharps of rosewood, another unusual feature of the console is the layout: here, for the first time on an electropneumatic console, Casavant organized the draw-knobs according to chorus (with the stops comprising the principal chorus, the cornets, etc., each positioned in a straight line). The Foundry congregation is ecstatic about its new organ. Congregational singing has never been better, and visi¬tors are coming to the church in increasing numbers, staying to become members of this active urban congregation which now feels great pride in the valuable addition it has made to the Washington musical community.